Looking to change roles or trying to find your first professional job? The job hunt can be a huge process, and one that is highly competitive. : one 2017 statistic suggests there are 4.8 job seekers for every entry-level role available. Further, those transitioning between roles or industries can face steep barriers and biases. Navigator's five part job hunt series will cover the steps you should take to maximise the job hunt thoroughly, thoughtfully and effectively. In this article, we discuss how to make a comprehensive plan. From the beginning, you need to create a plan of attack. The job hunt can be overwhelming and all-consuming. Because of this, it is crucial you consider each step in the process so you can set manageable tasks to complete over time. Writing a list of achievable steps and setting deadlines makes you more likely to achieve your goals, and you’ll produce a high quality application which will help you stand out in the job market. To keep on top of this entire process, Microsoft Excel and a trusty calendar are your friends. Most people think Microsoft Excel is purely a numbers program, however, it is a very handy tracking tool. The beauty of Excel is it’s order; you can store a lot of information in one place and can utilise the tab function to create multiple sheets, as seen in the picture below. 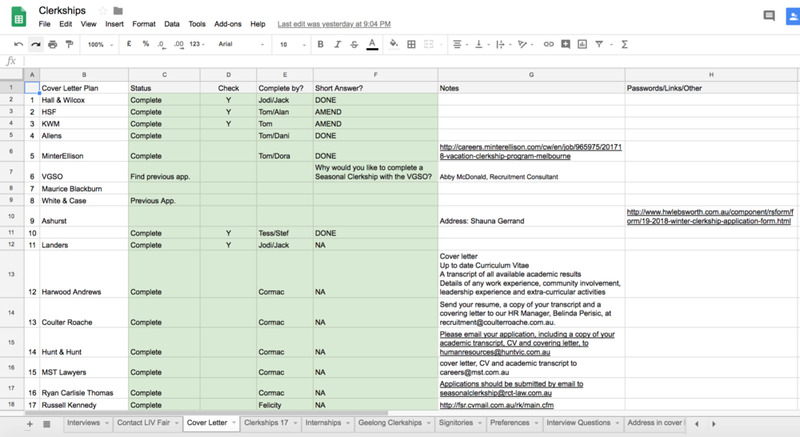 This is a great way to take an orderly approach to the job hunt and keep an active tab on your progress. We are big advocates of saving your work on a cloud system such as Google Drive. You can access Google Drive documents literally anywhere (at work, on your phone and at home). We highly suggest downloading Google Drive apps to your phone, namely Google Drive and Google Sheets. Cloud systems also automatically back up your work, so there is low risk of losing documents. Not sure how to use Google Drive? Watch this video to get you up to speed. You should also create an organised folder system in Google Drive for your documents. We suggest having your standard CV in your main folder, one for cover letters, another for short answers, and one for supporting documentation (for example academic transcript, any accreditation or certificates). Where does a trusty calendar come in? Once you have created your simple plan in Excel, you should then put your set deadlines in your calendar as they arise. Regardless of whether you use a physical or electronic calendar, having dates written down will keep you more accountable to your goals. To top this, block out a period in your week to ensure you have ample time to complete tasks. In weekend 1 we have suggested an update of email address. Why? Foremost, if you’re using an old email address (hubbabubbaroks@hotmail.com or the like), you may be inadvertently giving a very unprofessional impression. Create a new one fitting your professional identity; most people use their first and surname, and a middle initial or a number if the name is taken (e.g. emilydsmith@gmail.com). Further to this, if you are already employed and on the job hunt, it is integral you use a personal email and not your work one! Work can track company email accounts and there is a risk a co-worker will see job search related emails. For privacy, ensure you use breaks to check your emails on your personal phone. For further tips of how to navigate the job hunt whilst employed, see this great article by Forbes. What are you waiting for? Start building your spreadsheet, making your goals, updating your email and putting time aside in your calendar! Subscribe to our newsletter to keep updated with this series.